Laser skin rejuvenation is more popular than ever as technological advances increase various treatments’ effectiveness and convenience. The introduction of fractional lasers provided patients with the option of undergoing skin rejuvenation treatments without the downtime associated with earlier laser procedures. The laser skin rejuvenation and resurfacing patients I see at my London, Ontario, dermatology practice have a range of concerns that can be addressed with customized treatments. Even as the popularity of laser skin resurfacing increases, however, misconceptions remain prevalent. It’s also important to distinguish between lasers used for resurfacing as opposed to skin rejuvenation. In this blog, I’ll distinguish between factual information and fiction related to laser treatments. Having accurate information about the treatments we offer at DermEffects helps patients feel confident. Fact: Different lasers perform different tasks. We choose a specific laser treatment based on a patient’s concerns and skin type. We have multiple laser platforms available at DermEffects so we can customize treatments, a fact that sets us apart from many other practices that have only a single laser system. For example, I use the Cutera® Pearl™ Fractional laser for resurfacing. It is a fractional laser that requires only a single treatment to improve various skin conditions. The Laser Genesis, on the other hand, is a gentler treatment that requires 5 to 6 treatment sessions to produce the desired results. As an experienced dermatologist, I have the expertise to choose the ideal laser treatment to address your particular skin concern. Fact: The person performing the treatment makes a difference. Choosing someone to perform a laser skin resurfacing treatment is just as important as choosing a plastic surgeon. Even though laser treatments aren’t considered surgery, they are serious procedures that include potential side effects if not performed correctly. As a Royal College-certified dermatologist who’s completed years of specialized training, I understand the importance of selecting an experienced and trained laser provider and provide every patient with highly customized service. Fact: Laser skin resurfacing involves some downtime. The introduction of fractional laser technology enabled patients to undergo skin resurfacing treatments without the lengthy recovery period of non-fractional ablative lasers. However, some amount of downtime is necessary after a fractional laser skin rejuvenation procedure. Patients typically need 7 days of downtime following a treatment with the Pearl fractional laser. For some gentler laser procedures, such as when we use Laser Genesis or the non-ablative Spectra™ laser, there is no downtime. The trade-off is that to get optimal results, multiple treatments are usually needed. Fiction: Laser skin resurfacing is painful. The amount of discomfort patients experience varies depending on the laser used. For resurfacing with the Pearl Fractional laser, we apply a topical anesthetic prior to the procedure to numb the treatment area and minimize discomfort. Most patients describe the sensation of intense pulsed light (IPL) laser treatments as a series of hot pinches, or something similar to being snapped by a rubber band. Laser Genesis procedures are more like a warm facial. Any post-procedure discomfort can usually be managed well with pain relief medication. Fiction: Only people with light skin can get laser skin resurfacing treatments. 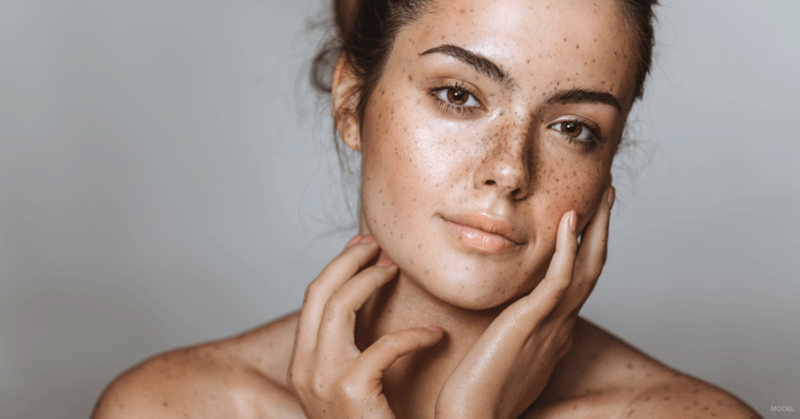 Even though certain types of laser skin rejuvenation treatments work best on fair-skinned patients, the idea that lasers won’t work on darker skin is outdated. By using new and existing devices in a smarter way, we can make laser treatment accessible to nearly everyone. Dermatologists assess a patient’s skin using what’s called the Fitzpatrick classification system. In the past, patients with Fitzpatrick skin types 4, 5, or 6 (darker skin tones) couldn’t be treated with lasers because the risk of scarring or discoloration was too great. Fortunately, that’s no longer true for most patients if the correct device is used, the settings are optimized, and the person providing the treatment is an experienced professional. Fiction: Patients get great results after one treatment. Some laser skin resurfacing treatments only need one session, but those involve significant recovery times and are recommended only for severe skin conditions. Most patients now choose gentler laser treatments that greatly reduce downtime but require a series of treatment sessions. The final results are still excellent. The best way to learn which laser skin rejuvenation treatment is best for you is to contact us using the online form or by calling DermEffects directly at (519) 472-8686 to schedule an appointment.